British made and flat packed, ready for delivery to your door; these cold frames and potting sheds are perfect for anyone wanting to protect plants from the British weather! Made from pressurised timber, with lifting lid with 2 position lid stay and styrene glazing. 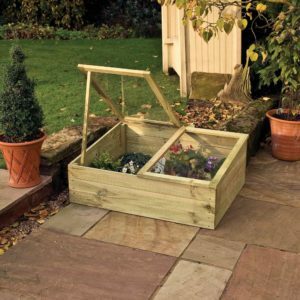 Cold frame, 0.38m h x 1020mm w x 810mm d, made with two independently opening lids; and fitted with two lid stays with two height settings. The timber used is pressure treated to protect against rot and 19mm thick. Price shown includes delivery.